3D Foam Squares — Add dimension to your paper crafts, shaker boxes, and other projects without adding weight. 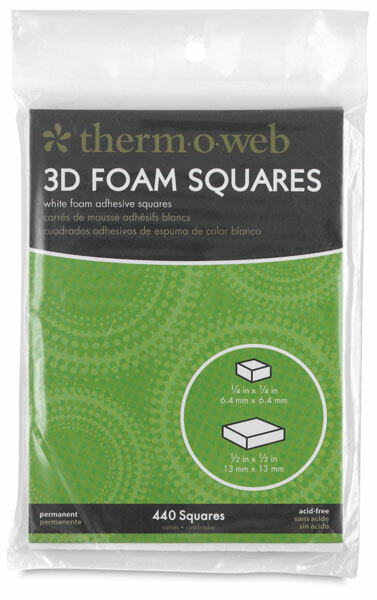 These double-sided, white, adhesive 3D foam squares are acid-free and PVC-free. The combination pack includes 352, ¼" × ¼" (6.4 mm × 6.4 mm) squares and 88, ½" × ½" (13 mm × 13 mm) squares. They come on a kiss-cut liner for easy removal. Mounting Squares — These acid-free, adhesive mounting squares are a great way to attach photos, paper, and other memorabilia to your projects in the classroom or at home. The box includes 500 white, double-sided squares. ® Therm-O-Web is a registered trademark.